Located in Summerlin's picturesque north section, Sun City Summerlin is a large planned community of 7925 homes. Developed by Del Webb in 1990, this residential area embodies the quality of the Sun City brand, with country club golf access, and a wide range of attractive housing styles and amenities. Residents here enjoy use of of three golf courses, four recreation centers, and a number of swimming pools, sports courts, and dance and show convention area. 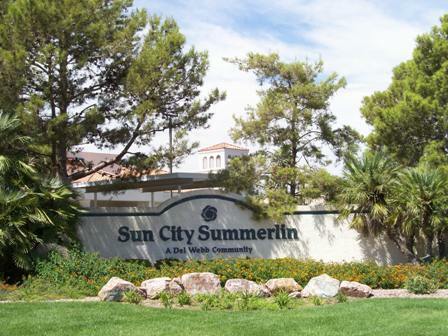 Sun City Summerlin is guard patrolled, and age restricted to those above 55. Properties here are designed and carefully spaced for maximum privacy and comfort. For more on Sun City Summerlin home designs and properties, please see our community area pages below. Our office has more than 60 years experience in Sun City Summerlin, and 35 years of local rental management experience. Contact us anytime for more information on Sun City Summerlin real estate, or to set up a home showing today.